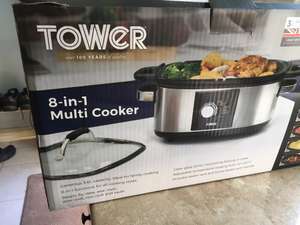 Tower 8 in 1 multi cooker. 3 year Warranty. Checking out at 10 pounds in B&M Leek. There are 2 prices on the shelves, £10 and £20, but they check out at £10. 5.6L capacity. Steam, fry, stew, sear, roast, slow cook, rice cook, saute. This is a super price for a slow cooker and it’s a big one! Thanks very much for sharing. Heat. Great price for a cooker like this. I won't be buying one as I treated myself to an Instant Pot last Black Friday which has transformed my cooking - but for only £10 had I not done so this'd be very tempting. Welcome to HUKD and happy posting! Well done. Good find. Have some heat! Deal posting newbie! This is TallChimneys first deal post. Help out by leaving a posting tip or just to show your appreciation for their contribution.